Kissy Kissy printed bodysuit from the Ocean Treasures collection. Sleeveless; straps snap at elasticized back. For in-store inquiries, use sku #2537212. Commando microfiber bodysuitlike tights for your top, provides a smooth look. Topped with patented smoothing waistband. Seamless design. Round neckline. Three-quarter sleeves. Formfitting. Nylon/spandex/cotton. Made in USA. Commando "Whisper" bodysuit in lightweight jersey-knit. Raw-cut edges lay flat to add coverage without the weight Scoop neckline and back. Sleeveless. Thong back. Cotton/spandex gusset. Nylon/spandex. Lace, nylon/spandex. Made in USA. I.D. Sarrieri "Nocturelle" bodysuit with semisheer back. Crew neckline; illusion yoke. Padded, sweetheart cups. Sleeveless. Formfitting silhouette. Moderate seat coverage. Nylon/polyester/cotton/silk/spandex. Imported of French materials. 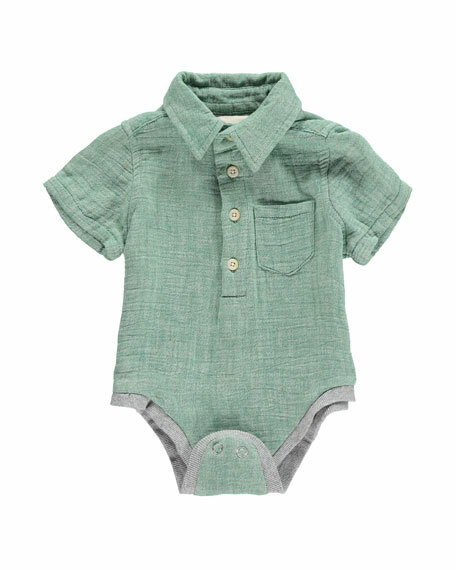 Me & Henry woven bodysuit. Pointed collar; button placket front. Short sleeves. Patch pocket at left chest. Snap gusset. Contrast ribbed trim. Cotton. Imported.